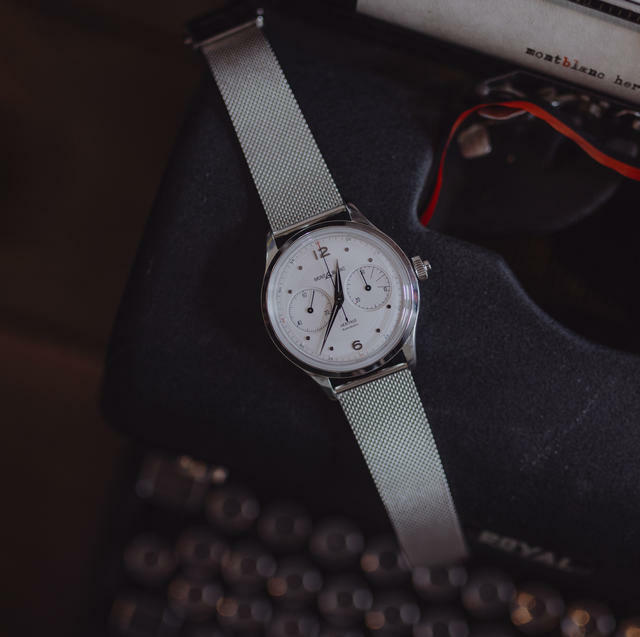 In addition to updating its sporty TimeWalker collection, which debuted ahead of the SIHH, Montblanc in 2019 expands its retro-tinged Heritage Collection with a series of Minerva-inspired designs. As a group, the new Montblanc Heritage Collection echoes 1940s and 1950s Minerva designs, down to the domed, two-tone dials, curved horn lugs and boxed sapphire crystals. Even the dial colors, which emphasize salmon, silvery white and caramel, exude that era’s timepiece scene. Most specifically, the chronographs in the new collection make use of a rarely seen ‘phone-call’ three-minute marker within the chronograph minutes counter at 3 o’clock. The indicator was sometimes found on watches at the time to remind the wearer to drop another coin into the slot while making a coin-operated telephone call. The Montblanc Heritage Monopusher Chronograph, on a new Montblanc mesh bracelet. And as is the case with all Montblanc watches, the collection’s Sfumato straps hail from the Montblanc Pelletteria (leather workshop) in Florence. The Montblanc Heritage Manufacture Pulsograph, new in 2019. Considered the highlight of the new Collection, the Heritage Pulsograph Limited Edition 100 is inspired by so-called doctor’s watches. This steel 40mm timepiece is powered by beautiful Montblanc (Minerva-based) monopusher chronograph calibre MB M13.21 (visible through the caseback). The pulsograph indication is graduated for 30 pulsations. 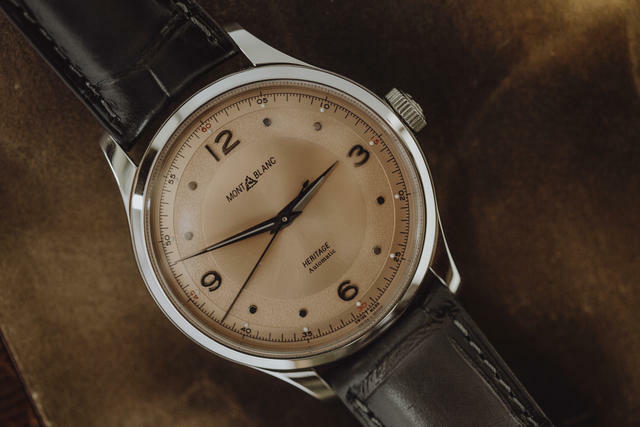 This salmon-colored domed dial nicely replicates vintage dials with its two finishes, applied Arabic numerals and index dots. Even the hands are bent, though now they are coated with Super-LumiNova. Price: 28,000 euro, or about $31,800. 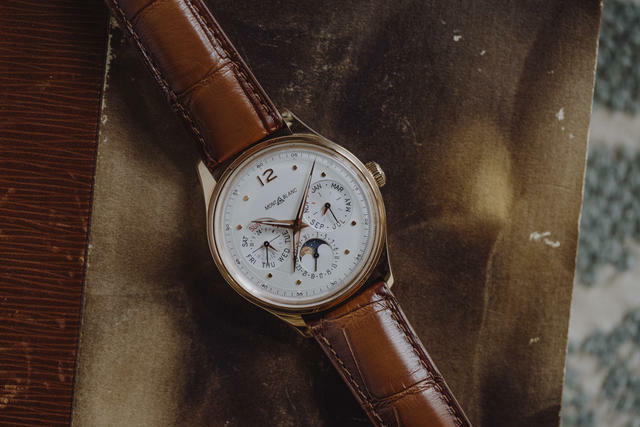 The 40mm Montblanc Heritage Perpetual Calendar features a brand-new manufacture movement, the (caliber MB 29.22) to indicates the hours, minutes, day, date, month, moonphase and leap year, all made extremely legible way thanks to its large counters. 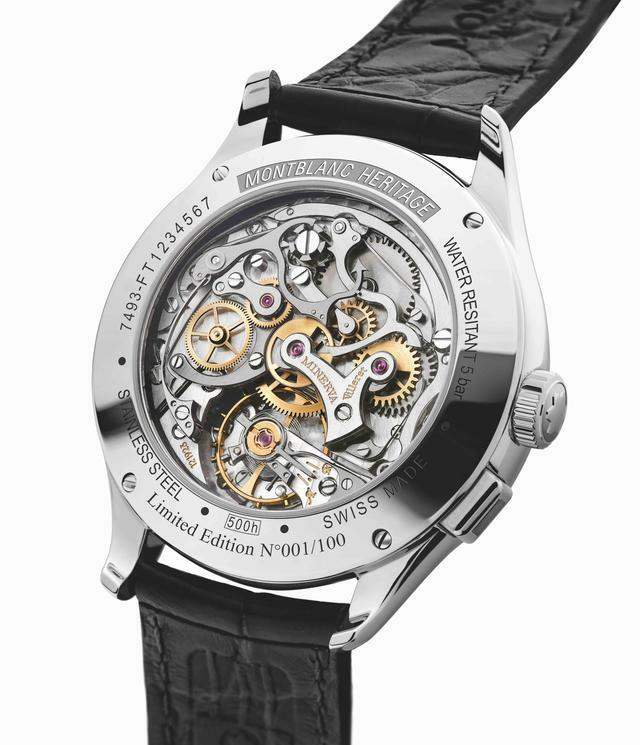 Montblanc Heritage Perpetual Calendar features a brand-new manufacture movement, the (caliber MB 29.22). The movement took three years to develop and is composed solely of wheels rather than the levers more typically found in perpetual calendars. 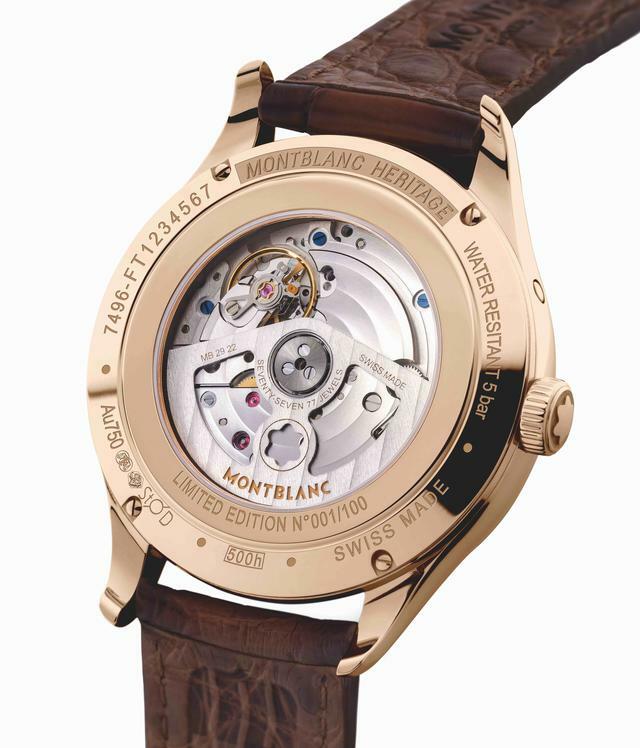 Montblanc says this enables the user to adjust the watch via the crown in both directions, making it far simpler to set. 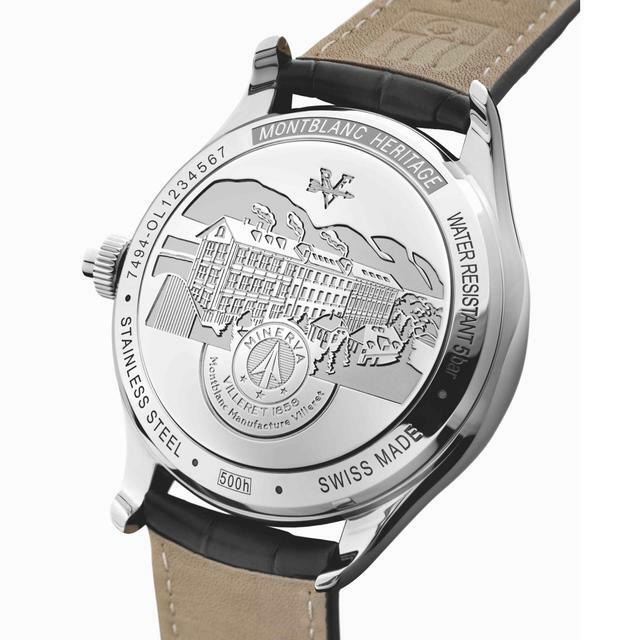 The 40mm watch is either made in red gold (limited edition of 100, 25,000 euros) or steel (15,000 euros). 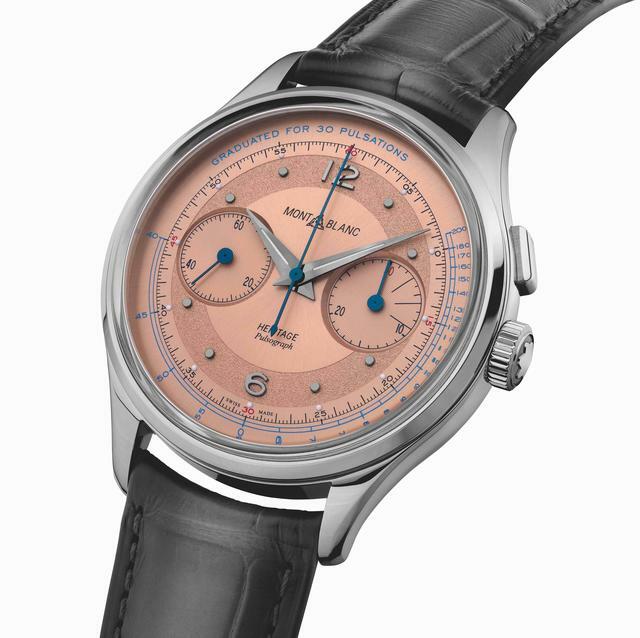 The 42mm Montblanc Heritage Monopusher Chronograph is another high-value entry to the collection. 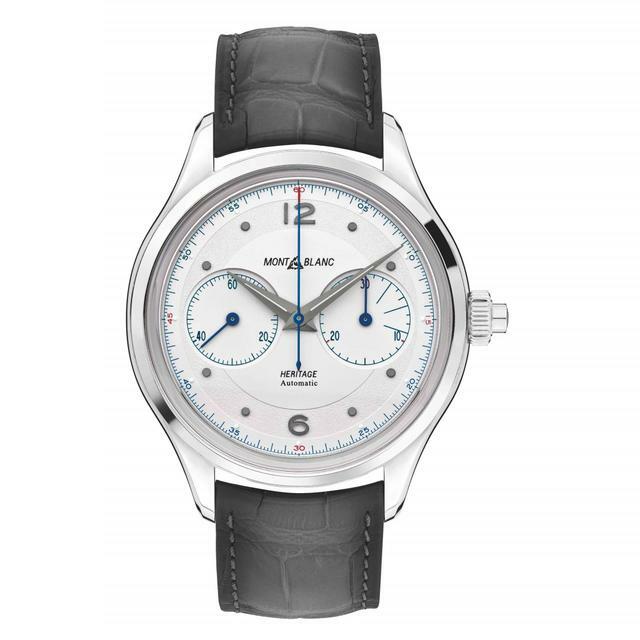 It offers a monopusher chronograph feature (Sellita-based with Montblanc’s own module) with a domed, silvery-white dial with two different finishes. This watch comes in a steel case with curved horns, a domed sapphire glass box and the Minerva Manufacture embossing on the case back. It looks great on either the in-house leather strap or a new steel Milanese mesh bracelet. Price: 4,700 euros, or about $5,300. 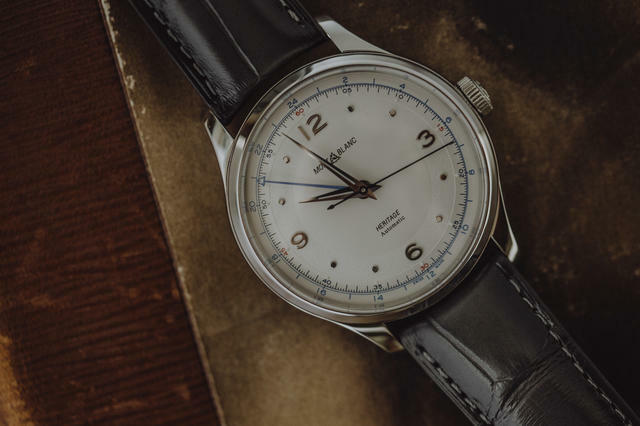 In addition to these highlights, you’ll find three everyday Heritage models with GMT, day-date or three-hand displays, and all with domed dials, index dots and curved lugs. These utilize ETA or Sellita base calibers. 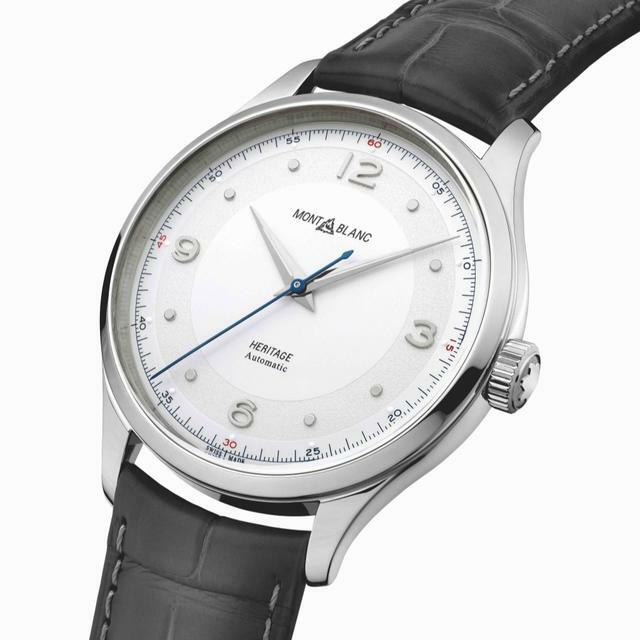 The Montblanc Heritage GMT (40mm polished stainless steel) with a 24-hour blued GMT hand, is available in three dial choices and strap options versions. 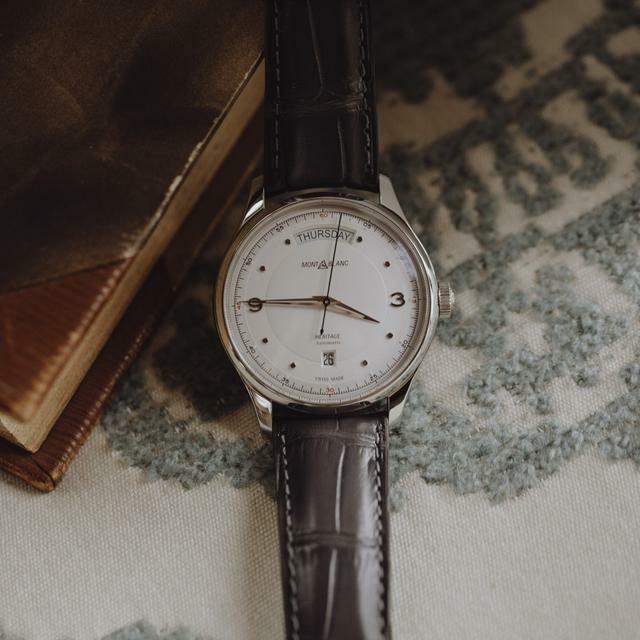 The Montblanc Heritage Automatic Day Date (39mm steel) offers a silvery-white with applied Arabic numerals while the Montblanc Heritage Automatic (40mm steel) arrives with a choice of a silvery-white or salmon-colored dial. Here there is a red-gold-cased option (7,900 euros). Prices for steel models start at about 2,150 euros.